These grainy art pieces display intense intimacy and impress with elaborate compositions. The lingering effect I tried to describe in the previous review returns, but with a twist: the gray, black and white configuration alludes more to film than to outdoor, direct landscape representation. There are additional features that consolidate this interpretative direction. The scenes are unusually close to the viewer, and it may seem as if we have been brought there by slow and deliberate camera zooming; the images we see project moments captured when the zooming stopped. Framing is the consequent feature — it is actually quite chaotic, even random, as if in this niche of “camera work” the cinematographer was given a free hand. I think that this quality adds a touch of freshness, lightness and unexpectedness, particularly important in artwork where the laboriousness of execution is just too evident to ignore. Altogether, looking at these pieces resembles a cinematic experience. I know I used the moving pictures medium to analyze and interpret paintings before. What makes this time different is that I think I can specify what kind of film befits Robin Neudorfer’s stills: I have seen these grays in some of Jean-Luc Godard‘s classic movies. But even without the more specific allusion, the drawings are composed with some movement in mind — whether it is the camera’s lens or the observer’s eye. For instance, the boxes piece includes a blueprint of animation: there are boxes of all sizes, and it is possible to envision a single small box gradually expanding (or large box decreasing in size), moving vertically in space, turning around its axis, to draw an entertaining (imaginary) curve. 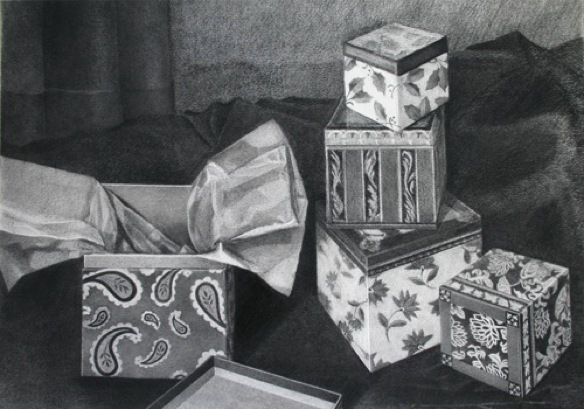 Eventually the box opens and something leaps out of it — and the frame. 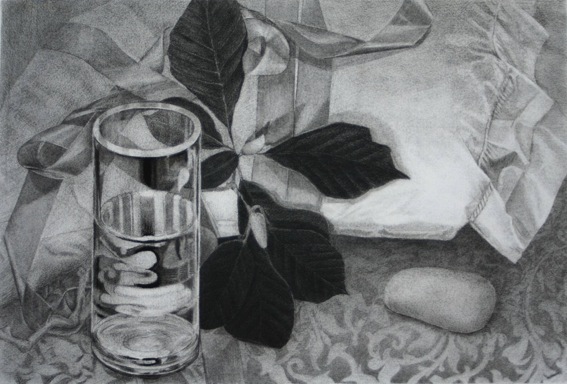 The piece with the glass and leaves is a more diverse pot-pourri where objects gravitate towards the center. I find the idea of putting a pebble, a glass of water and a branch into one still life so original as to remind us all of the capacity of the genre. Every still life here consists of several visual planes, each one is a potential miniature still life in itself. And all this without color! The pillows deserve a separate mention. I think that positioning a pillow on the eye-level is bound to produce some effect: induce drowsiness, dreaminess or simply remind the viewer of a dream he or she once had. 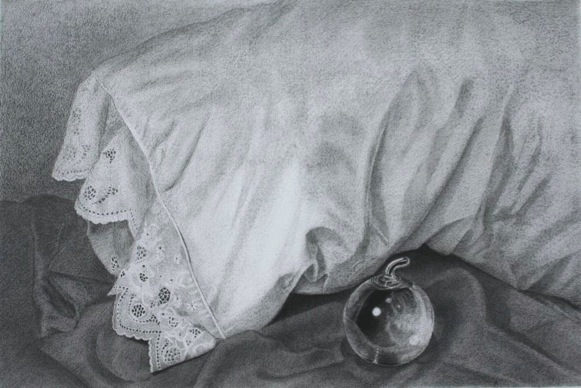 It is also possible that by showing us pillows the artist may be referring to her own dreams. Hence, the depicted objects may carry some private significance once revealed during sleep. In fact, we could be witnessing a snapshot of the subconscious — which adds symbolical value to the images. But it’s probably best to keep dreams from the interpretation and psyche from the analysis.